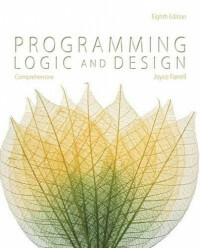 Prepare beginning programmers with the most important principles for developing structured program logic with Farrell's highly effective PROGRAMMING LOGIC AND DESIGN, COMPREHENSIVE, 8E. This popular text takes a unique, language-independent approach to programming with a distinctive emphasis on modern conventions. The book's clear, concise writing style eliminates highly technical jargon while introducing universal programming concepts and encouraging a strong programming style and logical thinking. Clear revised explanations utilize flowcharts, pseudocode, and diagrams to ensure even readers with no prior programming experience fully understand modern programming and design concepts. Farrell's proven learning features help students gain a better understanding of the scope of programming today while common business examples help illustrate key points. Readers can use this proven book alone or paired with a language-specific companion text that emphasizes C++, Java or Visual Basic.